Kids Clothes Week: Crazy Stripey Jumper!! 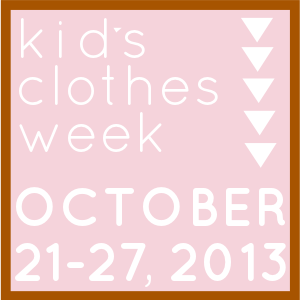 Another finish for Kids Clothes Week. I struggled with what to do with this fabric. It's a random remnant that I found at Joann's that happened to find it's way into my cart. I loved the pattern but it was kind of busy, so I thought I'd make a small library bag for her, but when I washed it, it turned into the softest corduroy I've ever felt. So clothes it was. I was thinking at first to make a simple skirt, but that would leave me with more scrap than I'd like, but not enough to do anything with. So I found this top from Prudent Baby and thought it would be a good challenge to upsize it. I didn't print it out (because that seemed like more work), instead I pulled up the pattern pages full screen and sketched out a copy freehand. I double checked my pattern against her measurements, then had her try it on again before cutting out the neck pieces. It went pretty well. I only altered the armpits, because they ended up being more of a "V" instead of a "U". I may have bribed her with promises of cookies and fake mustaches. Whatever works! Linking up with My Quilt Infatuation for Needle and Thread Thursday!